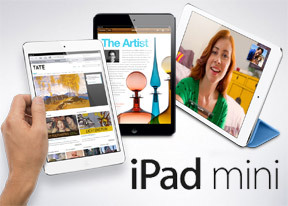 The iPad mini is driven by the Apple A5 chipset, which has two 1 GHz Cortex-A9 cores and a dual-core PowerVR SGX543 graphics chip. The amount of on-board RAM is 512 MB. We can't say we're thrilled with this kind of hardware - it is around two years old now and not up to speed compared to the quad-core Tegra inside the Nexus 7. The amount of RAM isn't impressive either, given that even the iPhone reached the 1 GB milestone already. So without further ado, here go the benchmarks. We start off with Geekbench, which puts the chipset through all kinds of stress tests like processing per core, graphics performance, memory performance, etc. The iPad mini hits last place here, behind its hardware twin the iPad 2. GLBenchmark focuses on the dual-core PowerVR GPU inside the iPad mini. The Egypt 2.5 off-screen test shows the GPU's raw power as it pushes a preset amount of pixels and ignores the screen resolution. The iPad mini got 14.5 frames per second, which isn't anything special in tablet terms but did beat the Samsung Galaxy S III and HTC One X.It's no surprise that the iPad 2 got an identical result here. The on-screen test shows what framerate the CPU averages on the screen's native resolution, in this case 1024 x 768 pixels. The low native resolution helped the iPad mini do 24.3 fps, extending its advantage over the Android flagships, which have more pixels to deal with. SunSpider showed an okay score for the iPad mini, just behind the ICS-running LG Optimus G. In BrowserMark the iPad mini managed to beat the LG superphone but didn't come close to the iPhone 5 and iPad 4.